When it comes to sports, everybody thinks of soccer, football, basketball, tennis and so on. I do not judge anyone by thinking like that; these ones are the truly, played-on-the-field sports. Unlike these, there is one sport that includes a lot of art: the men wear Latino bodies or tail suits, nice looking pants, shiny shoes with little heels, and the women wear aesthetic, overloaded make-up, finely cut dresses and a well-made hairstyle. This sport is called ballroom dancing, one of the oldest and must see entertainment sources ever. Until the last decade, dance sport was not seen as an actual sport, but as a source of entertainment. The last decennium meant a lot to ballroom dancing: 2000–2010 became the season when more and more competitions appeared and when WSF (World Sport Federation) decided to include WDSF (Word Dance Sport Federation) as a department of its own. 2020 will also be a great year for us, dancers: it will be the first year ever, when dance sport will be played as an Olympic Game at the Olympic Games of 2020, Tokyo, which will set up that ballroom dancing is an actual sport. I am a dancer myself and, believe me: this sport is really worth practicing! I can tell that the most fun part of ballroom dancing is represented by the competitions you participate in. The training sessions with a lot of sweat and cry will pay off at the competition as a result of your hard work. At a regular contest, every class is divided into group ages. The official classes are as follows: Hobby Class, Class E, Class D, Class C, Class B, Class A and Class S, from low to high. Up C Class, the competitions are known as “Opens”: Open Basic Latino, Open Basic Standard, Open Latino and Open Standard. The couples usually enter the ring and dance. If they dance well, the judge will give them a mark. The ones with the highest marks go in the next round. In the finals, when there are usually 6 or 7 pairs, the judge will award every couple one place. The average grade will establish your position in the ranking list. Besides having fun while dancing, the pairs can win a lot of rewards and prizes and … points that will be added on your dancesport card. The more points you have, the better and the sooner you will get to another category. 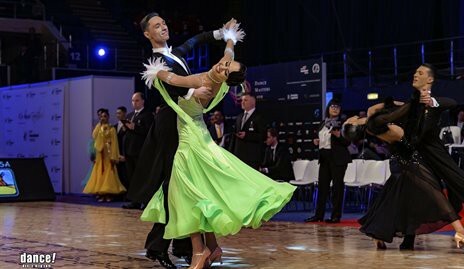 In a competition, you can perform Standard dances consisting of Slow Waltz, Viennese Waltz, Tango, Slowfox (also named Foxtrot) and Quickstep and/or Latino dances consisting of Samba, Cha-cha-cha, Rumba, Paso-Doble and Jive. Dances as Bachata or Salsa do not count as dance sport types. Yet, ballroom dancing comes with some drawbacks, too, among which are the expenses. The costumes are extremely high-priced because they are made of non-sweaty and not-so-easy-to-destroy material. One stone on the costume is sometimes as expensive as a T-shirt or a jacket. And there are tons of stones on one’s dress or suit. As I said, expensive, but worth it! The training sessions are the most important elements of dance sport. Without these, the competition and the technique would be nonsense. Every dancer has at least once had the feeling that s/he needs more training. This feeling is normal, because this is how our brain works: when losing a competition, we begin to accuse ourselves for what we have or haven’t done. Winning is not the essential thing, but experience!